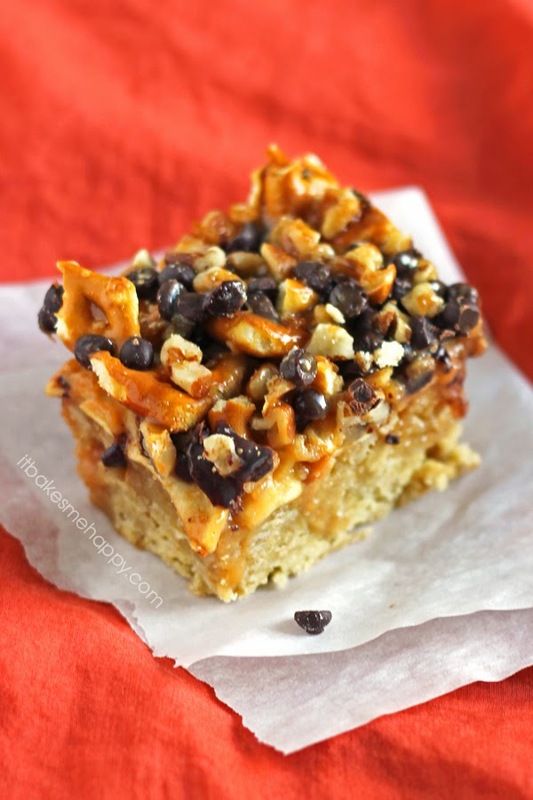 These rich, cookie bars have a delicious layer of oatmeal cookie topped with caramel, apples, chocolate chips, pretzel pieces and pecans. I love caramel apples and to me Fall always makes me crave a good caramel apple. Lately there have been some really amazing caramel apples popping up all over some of my favorite blogs! Which has only further fueled my cravings for one. Of course everyone knows that eating a caramel apple is pretty messy. So I wanted to create a new way to enjoy this seasonal classic, today I introduce you to my newest obsession – caramel apple cookie bars. A delicious layer of oatmeal cookie is topped with caramel, apples, chocolate chips, pretzel pieces and pecans. These rich, cookie bars are a real indulgence that you’re going to love. Serve them warm with a scoop of ice cream for a decadent ending to any meal, enjoy and happy baking! Preheat your oven to 350 F and line an 8"x8" baking pan with foil, grease well. In the bowl of your stand mixer cream together the butter and sugars until fluffy. Whisk together the flour, oats, baking soda and salt. Add the flour mixture to the butter mixture and beat until it just comes together. Press the cookie dough into the baking pan and bake for 18-20 minutes until golden. In a microwave safe bowl melt the caramels and milk for 2-3 minutes, stirring after each minute. Pour half of the caramel sauce evenly over the cookie layer and top with the apple slices. Sprinkle on the pecans, pretzels and chocolate chips. Drizzle the remaining caramel sauce evenly over the toppings and return to the oven for 5 minutes. Cool completely, slice and serve.